We have listed a few popular sample Irish golfing itineraries below. The purpose of this page is to provide a little more information for those interested in a golf trip to Ireland, with groups of courses that make sense to include on one itinerary and the corresponding approximate starting prices. Please know that if you choose to book a trip with us, your group’s itinerary will be created from scratch so that every aspect of your trip is custom-tailored to your group’s needs. Both Tom Watson and Greg Norman have called the southwest of Ireland some of the best golfing terrain in the world. This popular trip starts on Ireland’s west coast at Lahinch and culminates with the dramatic clifftop links at Old Head, one of the most scenic courses on the planet. The northwest part of Ireland is the most sparsely populated region of the country so this itinerary is for the golfer looking for the remote gems. Start at Ballyliffin, referred to by some as the Royal Dornoch of Ireland, and work your way down the northwest coast to experience some of the most rugged and beautiful scenery in these isolated golfing destinations. There are enough great courses in close proximity to the city of Dublin to fill an entire golfing itinerary. Enjoy many top links courses and the magnificent Druids Glen, considered the Augusta National of Ireland, without leaving the surroundings of Ireland’s most vibrant city. 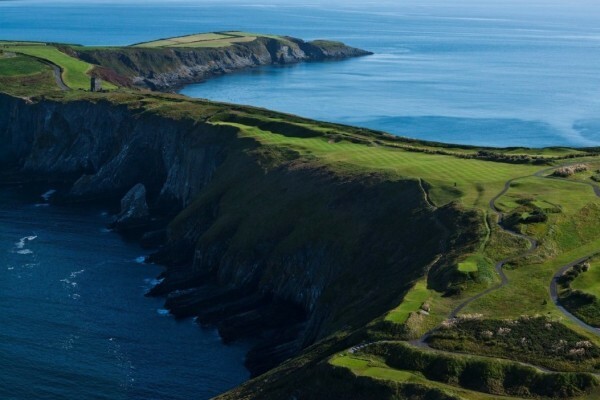 You can traverse the entirety of the island of Ireland in seven hours by car, so there’s no reason you can’t play all the top courses in one go if you’re feeling ambitious. You may want to consider adding the Old Course at Lahinch and The European Club to this itinerary to truly cover the best of what Ireland has to offer. *Prices are based on 4 golfers staying in budget accommodations for seven nights and include a self-drive van.